The following narrative and accompanying pictures are submitted by the Woodruff family. “On Aug. 23, when the Russian troops started coming into Bucharest the Roumanian Govt. capitulated, and they opened the gates of the camp. We were told to stay around as they might move us out of the city. “On Aug. 24, the Germans who still had control of some of the airfields started bombing the city. They bombed for 48 hours without letup. They hit the prison camp hospital & some of us helped get the wounded out. The Russians names are Pavel Suprunenko and Volodya Soklakov. 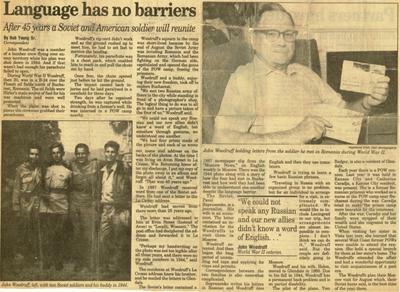 In 1987 John received a letter from one of the Russian officers, Pavel Suprunenko. In 1944 John was 19 years old living at his parents’ home in La Crosse, Wisconsin. The letter was mailed to that address. John's parents were deceased but his brother, Bob, lived across the street; so the mailman gave him the letter to forward to John who had moved with his family to Glendale, California, in 1960. Pavel invited John to come to Moscow. After 45 years, John and his wife, Helen, went to Moscow for a reunion in August, 1989. John was the only one Pavel could get in touch with. A copy of the original 1944 picture, front and back, is included in this post. 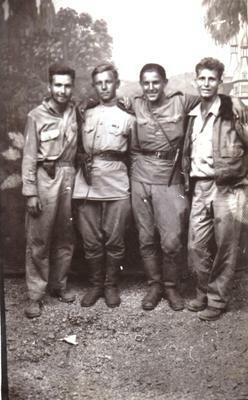 From left to right are John R. Woodruff, Volodya Soklakov, Pavel Suprunenko and Michael A. Stabile. 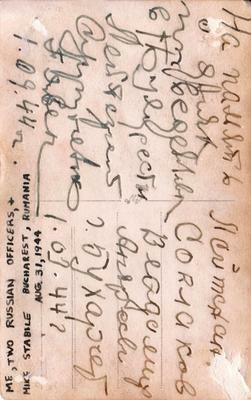 On the backside is the writing of Pavel, Volodya and John. A copy of a 1989 picture with Pavel on the left and John on the right is also included. 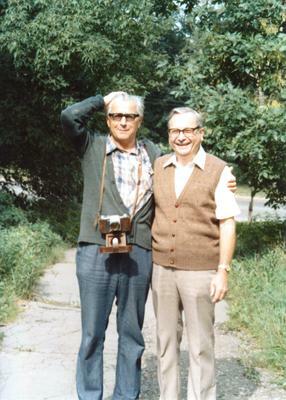 This picture was taken in Moscow during John’s visit with Pavel. “It was in memorable August of 1944. After the exhausting march on foot (70 km per day, sleeping by the way) we were suddenly putten on new ‘studebeckers’ (americans send them according to the agreement) and rushed into the Bucharest after the tanks. “Rumania to that time had gone out of war, and we were met with flowers and vine. During such greetings I saw two american fellows in dusty uniform. Their aeroplane was shooted and they not without adventure landed on parachutes, for several months were jailed in Rumanian concentration camp. I with my friend Volodia Saklakov, soldier so as I, embraced our allies. And joked upon them, why didn’t they open the second front against the fascists so long, as was promised by their governments. A 1989 newspaper clipping from the Glendale News Press is submitted with this post. Like my dear old Dad told me "Real stories beats anything Hollywood can do..."
Wow, what a great story! Thanks for submitting it! Thank you John Woodruff for your service and sacrifice that you made being imprisoned. Men like you are the reason that we have the freedoms that we have and enjoy today! It is heartwarming to know that 4 young men from different sides were able to forget their differences and become acquainted and then reunited in later years. Too bad the other two could not be found.